If you think traditional garages see a lot of action, then you haven’t seen an aircraft hangar up close. Then again, maybe you have, and that’s why you’re here considering the commercial epoxy flooring cost to coat your entire facility. There are several things that a commercial hangar will deal with that a typical garage will never see. First of all, these floors deal with quite a bit more weight as airplanes command far more mass. In addition to that, they face chemical spills, along with considerably more foot traffic. In other words, hangar floors need to be the very best, and they need to serve a number of different purposes. Are you ready to give your floor the advantage it needs? 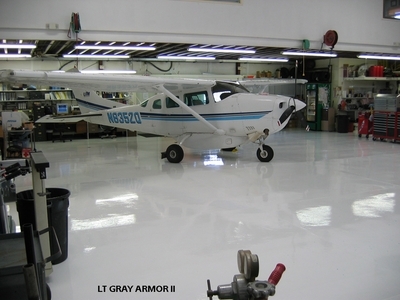 Armor II is an outstanding commercial epoxy floor paint that works as a two layer, single color product, perfect for the DIY crowd. In fact, you won’t need a single bit of experience to get the job done, making Armor II a great introductory package for those looking to get their facility in functioning condition. 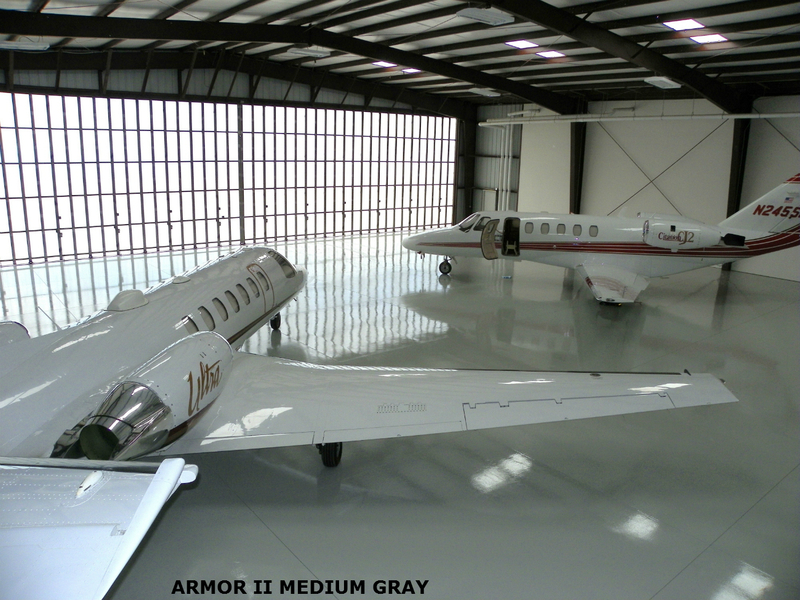 In today’s world, absolutely no hangar should exist without an epoxy flooring, and you couldn’t do much better than Armor II, we guarantee it. Universal Approval – Amor II is actually used by the United States Coast Guard and deployed in their hangars. If the military is able to trust it, why shouldn’t you? reapply it every two years or so. Sure, that might seem like a long way out, but your hangar can’t afford two to three days of downtime as you apply new epoxy. You need something that’s going to last, and Armor II is guaranteed to last up to fifteen years. Armor II contains everything you need to guarantee quasi-immortality for your hangar floor. The 2 part epoxy base coat can be provided in any color you wish, followed by the anti-wear epoxy topcoat. The benefits are numerous but what it all comes down to, is you will have no streaks, no bleed-through, and most importantly, you can trust this coating to last for many years to come. Could you really ask for more when it comes to commercial epoxy floor paint? The coating itself is rated for up to G-650 aircraft, but if you want to take it to the next level, you should have a look at the military grade variant. As you can see, there is plenty of reason to invest in industrial epoxy or even commercial epoxy paint whether the standard works for you, or you need to go with the military variant. Either way, now would be a great time to start considering a switch to the strongest epoxy on the market, and ultimately, a guarantee that your garage floor will stand the test of time. Finally, consider the fact that your floor will be much easier to clean than ever before. You won’t need to sit on your hands and knees, scrubbing and hoping for the best. Instead, you will be able to use a simple mop and a push broom to get rid of any dirt or debris. Cleaning has never been easier, and keeping your floor in good condition has never been more important. Not only will this upgrade make your floor more durable, you will also find that it creates a much cleaner work environment, which, in the end, should be the goal of any industrial facility. Prepare yourself for a much brighter work space and a floor that you can be proud of. It is, after all, one of the largest parts of your entire facility – make it something that you enjoy seeing every single day.